“Hoy” is a general term for a work boat used in harbors or similar sheltered locations to transfer goods and personnel to and from larger ships with drafts so deep they cannot anchor or tie up at the shore or along a pier. Hoys could be sail powered or rowed or both. The models below are of a specialized workboat, the anchor hoy, which was used to retrieve and relocate anchors or moorings in shallow waters. Anchors on large ships were huge and heavy. The largest anchors were carried at the bow of ships and often weighed several tons. These anchors were called “bower” anchors and if one were larger, it was carried on the starboard side and known as the “best bower”. 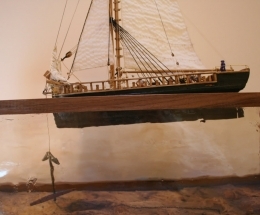 Moorings for ships were sometimes made of large concrete weights or old anchors. When a mooring needed to be installed or moved, or when an anchor needed to be taken to or from a ship or had been lost (see below) the anchor hoy was used. 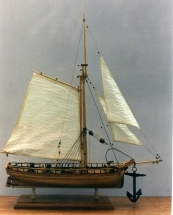 This model was build in 1/2″ = 1 ‘ scale (1:24) using plans drawn up based on the plans for an anchor hoy in “American Ship Models and How to Build Them” by V. R. Grimwood (1942). 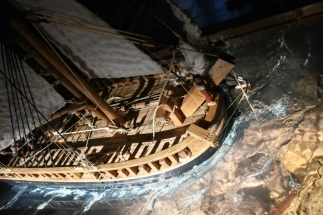 The model was scratch build using various hardwoods and the rigging was based on the Grimwood plans. Model has been sold. Plans are available. While researching ship plans in National Archives, I discovered a plan for a “hoy” from about 1800. The hull plan showed a large water tank as well as the large hoisting equipment at the stem characteristic of the anchor hoy. 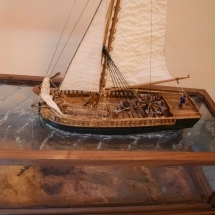 The model was scratch built using maple for frames, decking, masts, spars and trim, and red oak for planking. 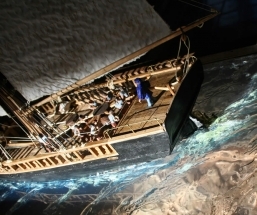 The National Archive plans were modified slightly for the hull construction, and the rigging was adapted from plans in the Grimwood book. 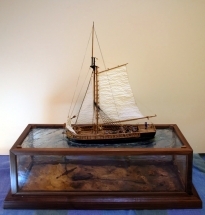 This vessels differs from the one in Grimwood in that it has a small cabin, has multiple stanchions along the side, and has a different hoisting rig at the stem. I modified the Grimwood rigging plan but kept the retractable bowsprit. This hoy is shown retrieving a lost anchor. Anchors of the “Admiralty Pattern” had two sets of flukes and a cross beam at right angle to the fluke arms. As the ship dragged the anchor along the bottom, the cross arm would cause the fluke arms to rotate so that one arm was down and would snag on the bottom if rocky, or bury itself in a softer bottom. The fluke arm projecting upward would often snag or “foul” the anchor cable making it difficult for the ship to retrieve (“weigh”) the anchor. It was common practice to install a buoy on an anchor. The anchor buoy was fastened to the anchor along the shank toward the bottom of the anchor and served not only to mark the anchor position for other ships as well as the anchored vessel, but also to provide means to retrieve a snagged or fouled anchor. The buoy rope would apply lifting force to the anchor in the opposite direction as that from the anchor cable itself, fastened to the top of the anchor and sometimes thereby release a snagged anchor. 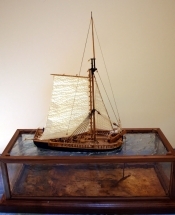 In this model, the case is designed to show the underwater action of an anchor retrieval. The snagged anchor has been lifted free from the rocks on the harbor bottom and is now hanging upside down beneath the hoy. The hoy has a geared double capstan, and the crew is using it to continue to elevate the anchor under the direction of a crewman standing on the stem. A large anchor could easily hole the hull of a hoy, so the crew must take care now to secure the anchor to the bow to prevent damage to the vessel. 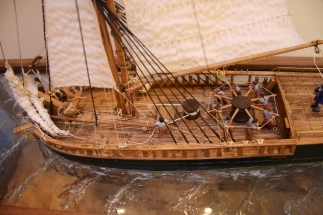 The bowsprit is shown in fully retracted position to clear the anchor being hoisted, and the foresails are furled to give the crew working space during the critical operation. The anchor buoy is lying on the deck of the hoy. The case is custom built of walnut with acrylic glazing. The lower case has colored and textured glazing to simulate water, and the harbor floor is modeled in plaster and painted. External dimensions of the case are:24.5″ wide x 32″ high x 11.5″ deep.